A few days ago I came across my old copy of On Photography, it’s slightly worn: the cover has faded and the spine is cracked; but this book changed how I saw the world. Weren’t photographs proof of genocides? After the Holocaust people looked at images of bodies piled upon each other; they promised it would never happen again. Sontag writes “photographs furnish evidence. 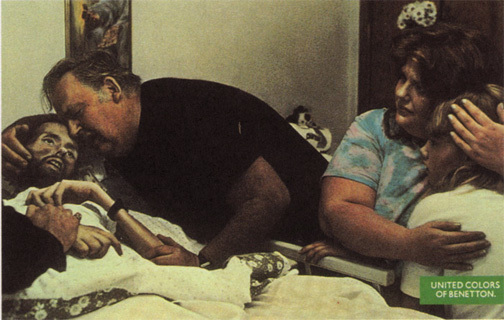 Something we hear about, but doubt, seems proven when we’re shown a photograph of it.” Perhaps those words and the Life magazine photo of David Kirby changed my perception of illness, it was 1990 and I was still too young to contextualize AIDS. I barely glimpsed the image of Kirby before the school librarian took the magazine away, she said it was for older students. His eyes haunted me, I wanted to know why he was sick. So I used my allowance to buy Life magazine from a drugstore. I couldn’t stop staring at his emaciated body, none of it made sense. He had AIDS, but I didn’t know what that was. It was a disease that hadn’t reached the suburbs. No one could explain it so I stored the magazine and didn’t look at those pictures again until I read Sontag’s On Photography. Two years later the story Kirby’s pictures told made sense. The power of photography was apparent as David Kirby’s image became a point of contention. A clothing company used Kirby’s photo in ad campaign for AIDS awareness, which sent religious groups in uproar. Top fashion magazines refused to run the ad. AIDS organisations felt United Colors of Benetton was exploiting Kirby in death. I wondered if the image would evoke the same feeling if it were seen in dozens of magazines. One of the reasons Therese Frare’s picture affected so many people was the way she captured death, it’s unsettling and tragic but when reproduced, it settles and we forget that a life was lost. I realised that after reading On Photography. This image of David Kirby remains a part of our world, a world that government officials chose to ignore until photographs wouldn’t let them. Sontag writes that photographs “seem to invite packaging” and in some cases, that’s true. Sometimes the meaning is lost in the process, and AIDS activists must have struggled with preserving their version of David Kirby’s legacy, but ultimately the viewer only sees the photographer’s interpretation of Kirby. Consider the cross above his bed as a dying Kirby’s mouth is slightly open, his father cradles him; it resembles the Pietà. There’s a framed photo of a hand, possibly Jesus or an angel. I’m not sure. When reproduced the cross is not usually visible, at least it wasn’t in the Benetton Ad; in fact they chose to publish the photo in colour. They meant for it to be more shocking and maybe it was since the ad was banned in several countries. Frere chronicled AIDS through a lens and the results are striking; but what captured me was Sontag’s description of photographing as an “act of non-intervention” because that’s essentially what Frere did. She could not stop recording to comfort Kirby’s grieving family. It made sense. Two years earlier, her actions seemed callous and On Photography put them in context. Sontag’s examination of photography as a tool that can function as a mirror to society but also as a tool that alters reality is fascinating. Sontag’s essay “America, Seen Through Photographs, Darkly” examines how much photography has changed in this country. It’s evident in Frere’s work as well, initially no one wanted to publish Kirby’s photo. It was deemed too graphic but Life decided to publish it. Photographs aren’t meant to make us comfortable — not always and Life magazine came to that realisation. Images of suffering is a theme explored further in Sontag’s essay Regarding the Pain of Others. 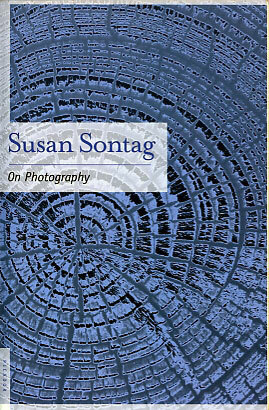 All six essays are engaging and culturally relevant, Sontag often references literature, which marries the two subjects (Literature and Photography). Sontag on Film will surely be just as thought provoking and I cannot wait for its early November release. Susan Sontag’s writing is always clever. She begins with a broad topic and manages to narrow it just enough to be understood. I imagine this upcoming collection of writings will be as significant as On Photography.